Live Documents - Office for the Internet Generation. 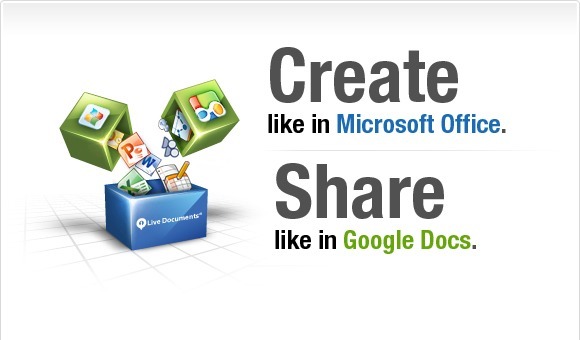 The features of Microsoft Office and the collaboration of Google Docs. Live Documents is the only online office suite that doesn't require you to sacrifice features for collaboration. We give you all the major productivity features of Microsoft Office and several new unique aspects that help you "get the job done". Live Documents also extends collaboration to new levels with unique features such as granular revision history, seamless co-editing and playback. Live Documents is the only online Office suite that offers "non-lossy round-tripping" with Microsoft Office - you can import the most complex Microsoft Office documents into Live Documents. When you export these documents back to Microsoft Office formats, all data, formats and object elements in the original document, including those currently unsupported by Live Documents, are retained as they were. Live Documents provides powerful capabilities in a familar user interface similar to the desktop applications that you use today. If you are a user of Microsoft Office or Open Office, you will find that there is nothing to learn to start using Live Documents.